New Gallery Tags! Have you noticed the new tags? On the left and right of NOTCOT.com? 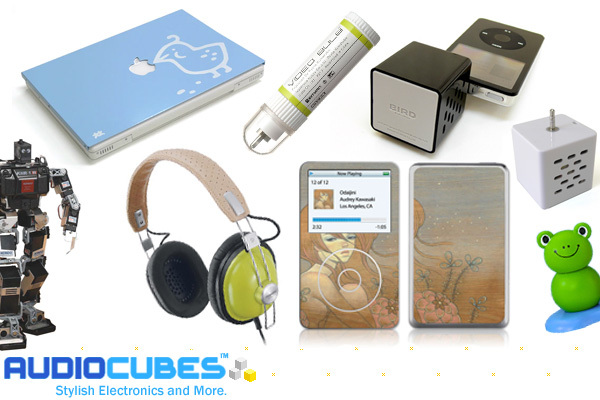 AudioCubes is sponsoring them this month, and showcasing some of their many fun and hard to find headphones, toys, accessories, and gadgets you didn’t even realize you’d needed. In fact they even just got the Audrey Kawasaki Gelaskins in (couldn’t resist tossing that one in the pic, after just posting the great new Audrey pieces below) - Dan (yes, co-founder and genius behind our tech) is quite the audiophile, and he swears by AudioCubes having ordered some headphones from them. Personally their robot section was my favorite on the site, as well as those tiny speakers that are so cute, tempted to get one for my ipod. You’ll also probably noticed quite a few products we’ve featured, like that video bulb that you just plug into your RCA and it becomes your tv screensaver? Anyhow, i’m in a giddy shopping kind of mood today! 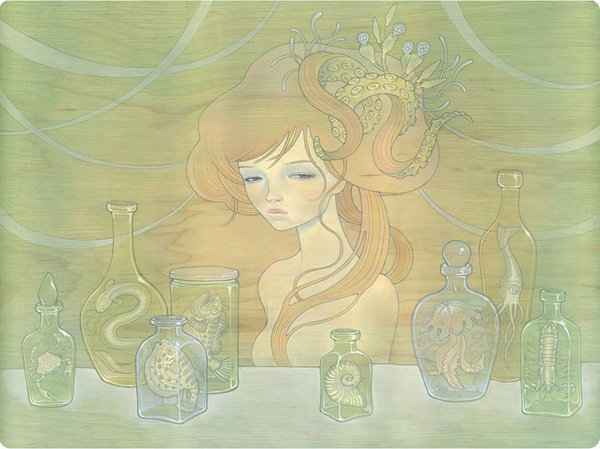 Audrey Kawasaki’s latest from the Innocents show at Lineage in Philly. It’s been a little while since we’ve had some good eye candy from her shown here, and i couldn’t help myself when i saw her aquatic themed pieces, so here’s a little something to get your creative juices running this Wednesday. Although i love them all - the one above is my absolute favorite: ‘umi no yami no jyoou’, 24x17… see more below. And not all of her work is innocent and dreamy eyed mysterious (or is that a mischievous? scheming? calculated? completely bored? apathetic? twinkle in their eyes?) girls… she also has some NSFW submissions to Grafuck. NOTVIDEO! 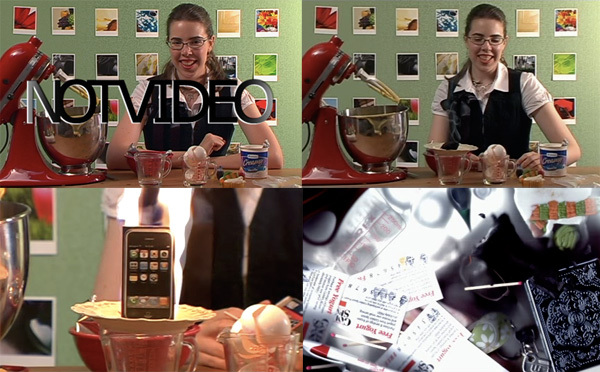 From those crazy marzipan knit cupcakes to FLAMING IPHONES to pixelated jewelry to smooshing cupcakes (and other things) on a scanner…. and they even stuck polaroids on the backdrop! the 2007 IDEA winners have been announced, and having just gone through all categories, i must say my favorites are in the Packaging & Graphics category. As you can see from the winners, transparency seems to be the winning theme… from Jawbone’s gorgeous floating box display to Panasonic’s Headphones that have a mix of image of the headphones and transparent side of the box showing the real thing! And i love Cargo’s new liquid foundation packaging that makes it much easier to get every last drop out, and less packaging to dispose of. 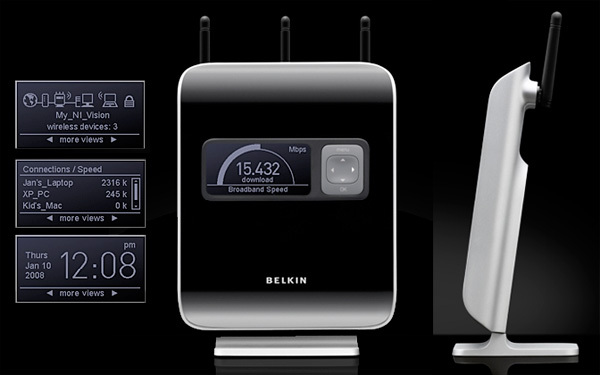 Also noteworthy - congrats to Belkin! Exciting to see my favorite Surge Protector take bronze in the Consumer Products category… and their N1 Router in the Interaction Design. 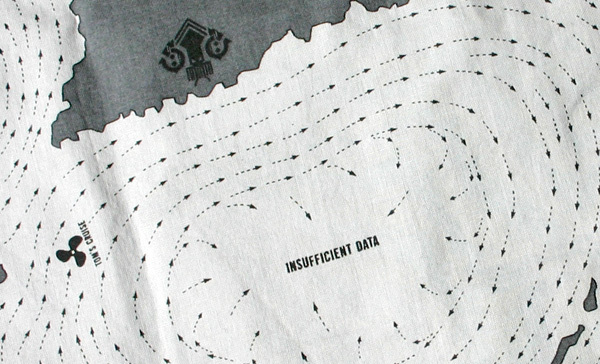 The Little Know-It-All: Common Sense for Designers. Published by Die Gestalten Verlag, June 2007. 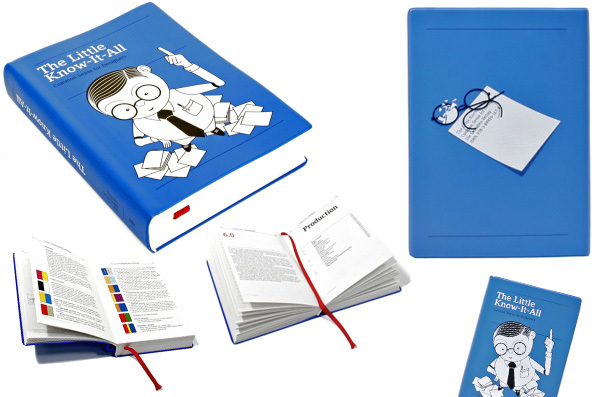 Knowing just those two pieces of information and seeing the cover, i already desperately covet this potential designer’s bible. So what is this little book? “The Little Know-It-All provides the fundamental information designers need to know to thrive in their growing field of practice. It is an indispensable manual of the knowledge currently required of designers as the evolution of media redefines their role and expands the disciplines in which they must be competent.” Shots of some pages below… and it’s only 29$ at Amazon. One of the most interesting new products announced by Belkin in the last week is definitely their N1 Vision router, and i got a chance to play with it in person at the Belkin Press Event last week. Finally a router that you don’t need to hide beneath a desk, or behind your couch, that you only look at when your internet is down and you need to reset it. This one has a large digital display and one large button to navigate through its quick overview screens showing you everything from your speed, upload/download usage, devices connected, and even the date and time! (Yes your router just became your room clock). With its sleek and slim upright design, i can already see this replacing airports aesthetically (although no printing/wireless speaker hookups). Also, while at the event, Belkin was kind enough to let me take a few snapshots of the gorgeous packaging for the N1 Vision, unfortunately the lighting in Vessel was terrible for photographing, but the images below should give you a good idea for now. Basically Belkin is really taking the user experience of its products very seriously, from the time you open the box, to every day usage. They have designed both the box and router to need minimal contact with the user… you unwrap, you open, and there is the router with an easy lift tab, and just below that lays two clearly labeled boxes for the power supply and network cable. Meeting him at noon? Perfect. The Matinee bag is ideal for holding all of your work day essentials as well as your must have products. The Matinee has dual pockets on each side and is accented with a reversible suede pullback, these discrete zipper pockets open up allowing room for all those unmentionables. When has your lunch break been sexier. See more pictures below of the model shots, purse angles/colors, and even a few sneak peeks of the launch party display of the fall collection… the display of bags delicately balanced on wood is quite interesting. AR+COOK (Art & Cook) has some incredible designer gadgets for your culinary side. 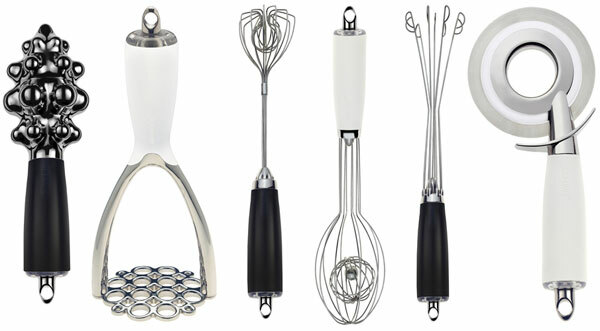 Left to right - citrus reamer, masher, twirl whisk, egg whisk, jet whisk, pizza roller… and that is only a mild black and white selection from their collection… they have quite the assortment of bright colors as well. Apparently Art & Cooks true claim to fame (beyond award winning design) is their Airgonomic handles - “While air is in the handle, zinc is in the core. A strong, durable material that is resistant to stains and scratching, zinc provides a long, maintenance-free life for more than 60 years. The weight of this metal allows the tools to work more efficiently, reducing the need for users to exert excessive force when completing the cooking tasks at hand.” ~ diagram of the Airgonomic handles below. Jealous Computers, apparently quite the outbreak is happening… well according to JealousComputers.com, the latest viral Nokia N95 campaign. Much like their Great Pockets campaign earlier, this one is a beautifully glossy website, complete with loads of youtube videos of “attacks” of laptops and pcs which are jealous of the new N95. Interesting twist, submit your own stories and videos for t-shirts… check out PSAs, attack videos, the shirts, their “how to deal with jealous computers at work” saftey poster, and even their N95 Disguise Mug below! On things to watch… WEJETSET (read: we jet set) is launching (and giving away a Mercedes C-Class Sports Sedan) September 18th , and i’m already excited to see what exactly it will be. So far it sounds right up our alley. What is it? Well, it claims to be “the store and voice of modern travel culture”. It will have both online and physical stores as well as an online and print publication… “The inventory consists of design forward, functional items that represent a spectrum of premium goods ideal for the smart traveler.” (sounds very NOTCOT)… and “[THE PUBLICATION] WEJETSET is the cultural reference for modern travel.” (sounds intriguing). They are also hunting for travel correspondents to report on their travel experiences, adventures and solutions for our online editorial. Oh, and about that C-Class, well you can sign up for their mailing list now, and a winner will be drawn on September 18th. I’ve never actually craved a fire extinguisher before, and suddenly i find myself here wanting one for the car, desk, kitchen, friend’s house, sidewalk… everywhere basically, b/c as a design object even, this Pinqy extinguisher is ADORABLE. At a mere 14cm tall, apparently it can put out the starts of fires… turning every man, or even girl, into an “ordinary fire man” as the videos say. And this one is by far the best. This looks like what happens when you cross fire extinguisher, a grenade, and a designer. Saw this at Core77, and its been stuck in my head since.